By Faith Alone (BFA), the youth group of Our Saviour’s, is for teens ages 13 to 18. Members of the group, along with their adult mentors, meet twice a month on Sunday evenings to socialize, care for each other spiritually, and discuss their “glums and glows” in complete confidence. Additionally, BFA members strengthen their bonds with one another through faith-based social activities like church sleepovers, backyard barbecues, beach days, ski trips and movie nights. They also support their church and communities through service projects, such as hosting the annual Easter Egg Hunt at Our Saviour’s, contributing to a local community garden that helps feed the hungry, and raising money for victims of natural disasters and to support aid programs, such as ELCA World Hunger. 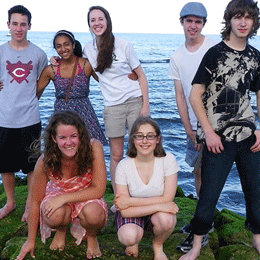 Finally, the group holds various fundraisers – from dinners and car washes to plant and Christmas cookie sales – to help pay for trips to the New England Synod Youth Gathering each September at Hammonasset State Park, Madison, Conn., and to the triennial ELCA National Youth Gathering, next scheduled for July 2018 in Houston. The national event, last held in Detroit in 2015, typically brings together more than 35,000 young people for a week of fun, learning, service, music and worship. For more information, contact us or click on the links below.